Back in October, I introduced this series (here’s a link to the opening post) about the specimens you’re near guaranteed to see in every natural history museum. We’ll take each specimen in turn and have a look at why they’re a usual suspect for display in a natural history museum. Legs like pegs, it’s Japanese spider crab. One down, 8 to go. The first specimen we’re going to take a look at is the Japanese spider crab. Japanese spider crabs are just one species, Macrocheira kaempferi. Confusingly, there is also a group of crabs, the family Majidae, called spider crabs which doesn’t include the most famous spider crab of them all. 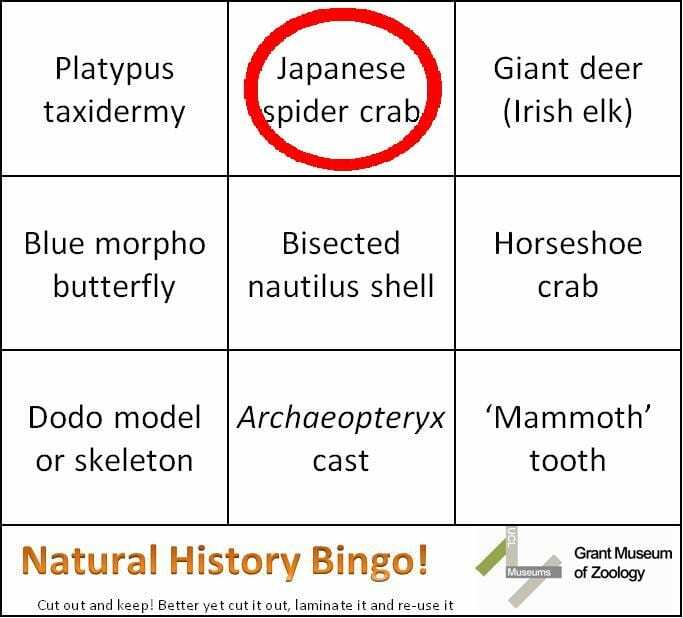 Japanese spider crabs are mostly found in coastal waters of southern Japan and have been recorded in waters as deep as 600 m so why do we find them in museums all over the world?